Lil' Bug has lots of dots, and lots of bugs too. 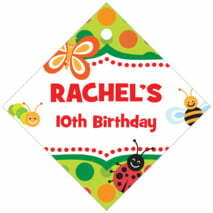 Little bees, dragonflies, caterpillars, and ladybugs dot this cute style, along with multi-colored dots of all sizes. The chunky, hand lettered font doesn't stand still, either; it bounces up and down like a line of little kids who are waiting for roll call to be over. Altogether, a style that's full of fun! Available in many bright colors for a party for your special person. 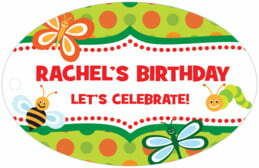 Customize your Lil' Bug canning hang tags today! 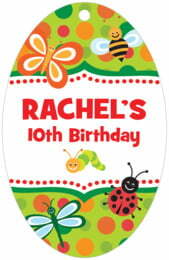 Lil' Bug canning hangtags and food tags are printed on extra-thick cover weight white paper and come in a variety of sizes and shapes, including square, circle, a scallop-edged circle, ovals, plus other more intricate shapes. They are printed on one side, and are blank white on the back. You have the additional option to add text on the back for a small fee - just ask! Evermine canning jar tags come pre-punched with a small round hole to thread your choice of tying material. They are punched out individually and packaged as a set in small bags. Select a shape above to start designing your Lil' Bug canning hangtags to get started!